Tired of email messages not getting through, or remaining unopened? "Discover How A Revolutionary (But Yet Very Simple) Tool Will GUARANTEE That Your Message Reaches Your Members Anytime, Every Time & Without Fail!" Taking into account SPAM filters, RSS software, and lazy or busy readers who dont even open your email, you can reasonably expect only a very small percentage of your intended readers will even SEE any given message you send. Only 19 of newsletters are thoroughly read by the recipients. The fact that email users continue to receive more and more email has caused them to become even more stressed and impatient when going through their inbox. Email recipients are increasingly using spam filters as an easy way to eliminate newsletters they no longer wish to receive. The Email Newsletter Usability Report found that 82 of email users had no idea what the term "RSS" referred to, and that people scan headlines and blurbs within RSS feeds with more abandon than they scan email newsletters! Your Message is GUARANTEED to Get Through! All it takes is a simple quick install of "Contact My Members" and you can rest assured your message whatever it is gets through to your members. All of them. Think about it. EVERYONE has a homepage the start page that is visited every time a new browser is launched. And your message will be right there, at the top of your members homepage impossible to miss. Your message will not interfere with their normal homepage. Your member will still be directed to their personal favorite Yahoo, MSN, Google, or whatever. But, the benefit to both of you is that YOUR MESSAGE will appear right at the top of the page. Not large, not blocking anything, but it will be there, right in front of your members eyes, guaranteed to be seen. Incredibly Simple to Implement and Update! Simple Installation of this PHP Script Gets You Started Quickly! Just follow the simple instructions and you will be up and running in minutes!?! Admin Area Gives You Full Control From the scripts admin area, you have full control over the appearance and content of your messages. Update your messages as often as you wish and it will never be obtrusive to your members. Simple Member Activation Your members merely enter their name and normal homepage into your simple form, submit the information and are given a link to use in the place of their normal homepage link. They will still be directed to their regular homepage, but your messages will appear at the top of the page! Your Message Appears Automatically Once you have defined the appearance and content of your message, and your members are using the specially generated links as their homepage link, your messages will always AUTOMATICALLY appear at the top of the page, EVERY TIME your member starts their browser! You Will Love It, And So Will Your Members! 100 of Your Messages Will Be Delivered You will never have to worry about spam filters or other deliverability issues again! Your Members Will Appreciate It Not only will YOU be happy with reaching every member, whenever you like with a new message, your members will appreciate being "in the know", automatically receiving updates as they are needed, without having to wait for the next email if it even gets through! Increase Your Sales and Member Response Think of the results you are seeing now with your email messages. Now multiply that many times and imagine what it would be like if EVERY MESSAGE reached EVERY MEMBER! Awesome thought, isnt it? So Easy To Setup and Operate Youll be up and running in minutes! Theres hardly a learning curve to this script at all just insert your HTML code in the proper box to create your members message and get them to use the special links for their homepage, and you are all set. Simple right? Easy to Generate Member Interest Many of your members will want to take advantage of this by using your special home page link. A good way to generate even more interest is to offer special gifts or incentives that will only appear in the special messages from the script. Fully Customizable When you choose the Private Label Rights option below, so you are free to tweak and edit any part of it you wish, as well as sell it as your OWN! As email users become even more buried in spam and list response rates continue to dwindle, isnt it time to make use of technology that allows you to regain the edge? No, its not the time to give up totally on email, but IT IS the time to put alternatives in place that work, and be a step ahead of your competition. It works to reach every one of your members who uses the special link as their homepage link, giving them updates, offers, and important messages you can change at a moments notice messages you know WILL BE SEEN. You may not be able to persuade all your members to edit their homepage link. The fact is, that even if a small percentage of your members do so, it could still mean a SIGNIFICANT difference in the total number of your members who see your message and click through to your offers. 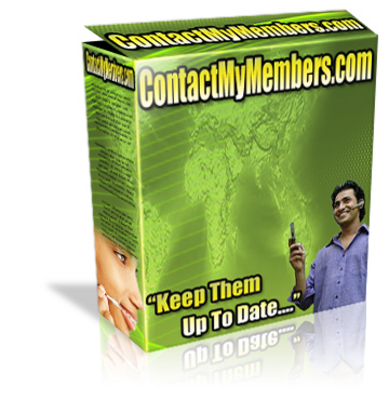 The Contact My Members tool is ASSURED to get more eyeballs on each and every one of your messages. And more eyeballs on your messages translate into increased response. And if you're a marketer like myself, increased response means more profits for you! Dont delay put this script to work for you today. Thousands Of Ebooks And Softwares For Resale.